Spacious four bedroom Moorish-style villa built around a large shaded courtyard, lots of character, totally private large walled garden with magnificent pool, olive, orange trees, superb mountain views. A rural retreat. Orgiva is five minutes drive or a 20 minute walk. Bars, restaurants, health food shops, supermarkets. Nearby charming mountain "white" villages. Beach 30 minutes, Granada 45 minutes. Ideal for two families (two cots, two highchairs and a rugged, three-wheel pushchair are all provided) or a group of friends. The house is not fitted with air conditioning as it is mainly built in the traditional style with very thick walls to keep the bedrooms cool, however there are fans in every room. We do not have a barbecue due to the risk of fire in the summer. You are welcome to use disposable barbecues but please ensure they are safely put out when finished. Please note: If you need more space you can also rent the casita opposite which has room for another two adults and one child. The entrance to the casita's land is opposite La Estrellita's front door. Enter property ref S17106 above for more details. Bathroom 1 with shower and toilet. Bathroom 2 completely refurbished in 2009 with new, large roll-top bath, WC and large shower area. Very large open-plan kitchen sitting room with two large sofas, armchair, TV and DVD player (plus many books and DVDs) and a wood-burning stove. Cooker, hob, fridge, fridge/freezer, microwave, dishwasher, toaster, iron. There are a couple of very good golf courses, one by the sea and one in the mountains, one within 30 minutes drive of the villa and the other 50 minutes. Notes on accommodation: There are electric fans and electric radiators in every room. Villa very suited to children with pushchair, two highchairs and two cots provided - plus toys. Garden is mostly laid to lawn, is flat and enclosed within high walls. There is also a swing. There is wi-fi broadband accessible from most rooms. Outside: Large shaded courtyard which opens out onto a third of an acre of grass with many trees. Included are hammocks, sun loungers, a child's swing, several outdoor tables and chairs as well as a completely secluded lower terrace. Pool is large and totally private. Utility Room: Washing machine. Cleaning / Towels / Linen / Maid service: Bath towels and linen are provided. No pool towels. Guests staying longer than one week are asked to change bed linen. Property cleaned before and after guests. 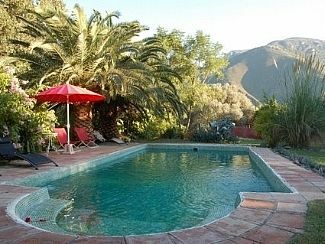 From the villa it is a 35 minute drive to the nearest beaches, Salobrena and Motril. Granada Airport is around 50 minutes away. Malaga Airport is around 1 hour and 3/4 away. Mercia Airport is around 2 hours away. Orgiva is five minutes away by car. Granada (home to The Alhambra) is 45 minutes. The local, extremely picturesque mountain villages are around 30 minutes drive up the surrounding mountains. Tibetan monastery up in the mountains, is around 40 minutes away. Beaches around 30 minutes drive towards the coast. Lanjaron, a nearby spa town with a castle, is about 20 minutes. The villa is based in Estrella which 5 minutes drive or 20 minutes walk from the local town of Oivrga which is very friendly, with lots of bars and restaurants. There are two health food shops and a covered market. A weekly outdoor market selling fruit and vegetables, as well as crafts, jewellery, etc takes place every Thursday, close to a children's play area. The town has several banks, all with ATMs, as well as many supermarkets and bakeries. Walking and horse riding are very popular activities in the local Alpujarras mountains and it is possible to go on organised trips. Booking Notes: There is a 50% deposit payable immediately to secure the booking. Remaining amount due 1 month before departure. There is a breakages fee of £100 to be paid together with the final instalment. Pool towels not provided. Changeover Day: Our preferred changeover day is Saturday. Notes on prices: Please note - 2011 prices were held until late 2013 as we could no longer keep on absorbing rising maintenance and utilities costs. Prices are for the property per week in UK Pounds. Rates for long term lets are negotiable.